Regular readers of this blog might know my first article about the different behaviour of Mark Knopfler’s Ernie Ball volume pedal compared to recent Ernie Ball models. In short: In the 80ies a different poti was used that caused a completely different sweep curve than later ones (see diagram below). Knopfler’s pedal changes volume drastically over the first part of the pedal sweep range. This allows him to perform the violin-like fade-in notes he is famous for with much more intensity than the new pedals. Also, during the last part of the pedal sweep – from middle to full – Knopfler’s pedal changes the volume only moderately which means you can adjust the overall volume of the guitar much more precisely than with the new pedal. Let’s say you want to set the level to something like 80% (which Knopfler often does), the new models require a pedal position that must be accurate to a tiny fraction of an inch, just a bit more and you are instantly at 90%, a tiny bit less and you are at 70% or even less. I found this extremely difficult to perform with your foot while playing and singing. 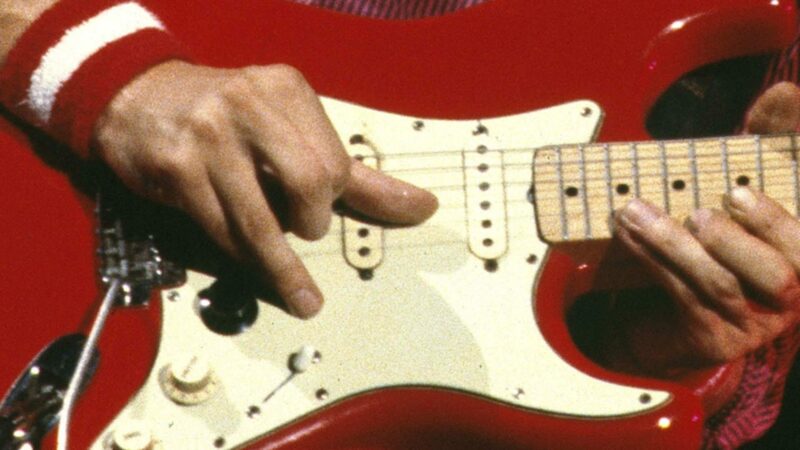 Knopfler’s pedal can be rolled back for an inch to have the desired level, half an inch more and you might have 85%, half an inch less and you are still at let’s say 75%, so it is much easier to adjust. Knopfler himself is aware of the problem so his roadie Ron Eve (or was it already Glenn Saggers?) just bought the remaining stock of the old potis from Ernie Ball to have replacements for all times. I have examined Ernie Ball pedals from the last decades but almost all had the new type of volume curve. I just managed to find one from 1986 which seems to behave like Knopfler’s, while my 1989 is already wrong. Surprisingly both the 1986 and the 1989 have an Allen Bradley poti, both made in Mexico. Later they came with a Canadian poti, today with one from Japan (custom-built by Tocos). I took a lot of measurements to see what really happens (diagram below), and found that all the newer potis behave almost identically. Unfortunately the original poti is no longer produced 🙁 . Allen Bradley was sold in the 80ies and soon stopped making them. The original type is – as I found out – extremely sought-after, in other words almost impossible to get. 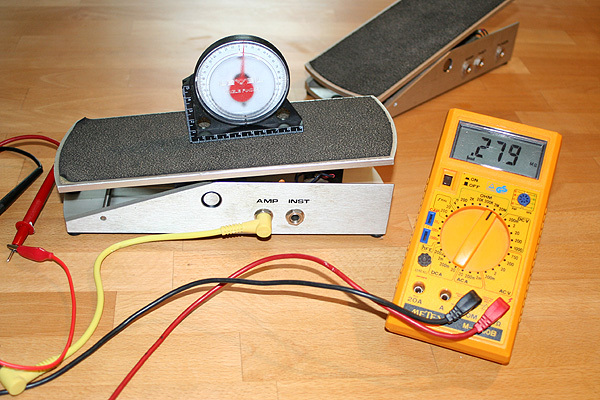 In addition, Ernie Ball changed some details of the pedal itself – e.g. to accommodate the new potis which have metrical threads instead of inch threads – so a direct replacement is often impossible anyway. Since these potis were all designed for heavy-duty usage (“extended life”), replacing it with some ordinary poti wouldn’t be a good idea – and possibly not easy anyway. Ernie Ball reacted to the situation and implemented a switch which enables two different volume curves, something that seems like a solution. However, my measurements showed me that it in fact changes the curve, but not really to what it was with the old poti. If you look at the diagram you will see what I mean. Besides, with the additional 220k resistor the taper switch puts in, you will lose a bit more treble, too (by the way, this is the reason you cannot simply increase the value of the resistor to make the curves more similar). Q:I recently had you guys rebuild my older EB Volume Pedal and the new pot does not distribute the volume like the old pot did. Is this correct? A: We have used at least 4 different companies to custom-build our potententiomers since the pedal’s inception in the 70’s. Since 1998, we have been using Tocos pots, which we feel are among the very best available today. However, they do have a different “sweep” than the older pots do. 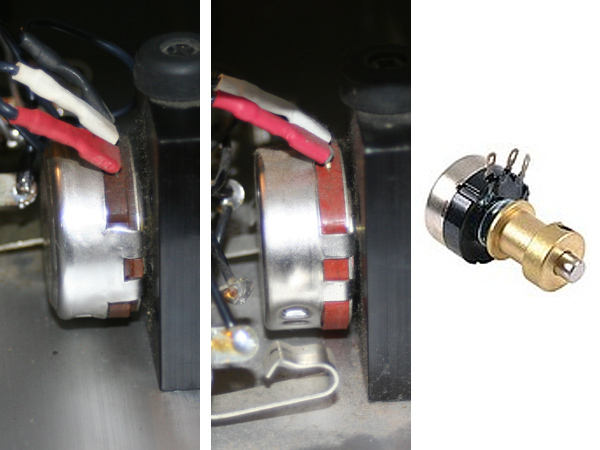 On top of the fact that potentiometers in general have very wide tolerances, the fact that upon rebuild we are removing one vendors pot and replacing it with another, there will be some obvious differences in the pedal’s sound. Here’s the scoop: we no longer stock the pots of old, not only because we can’t get them, but also because we do not think they are as consistently good as the Tocos pots. The Tocos pots are the most consistent, high quality pots we have tested. With regards to the sweep changing, that is due to modern day pot manufacturing techniques that are used across the industry. In my first article I described that I swapped the cable from the guitar and to the amp on my pedal, so I got a curve closer to the old ones. This however had a technical drawback: you lose a lot of treble when the pedal is not at full position (much more than you normally do), so it was not really a solution. Without being a technician, you can see huge differences in the diagram. On the horizontal axis we have the pedal position, on the vertical we have volume output. The 1989 Allen Bradly (red) and the Canadian poti used in the 90ies (blue) have almost identical curves. This is only slightly changed with the taper switch (green). The yellow curve is the original poti style, and the orange curve is the 1989 poti after my modification (see below). Believe me, I myself am very pleased with my result 🙂 , and don’t forget that potis differ due to tolerances, so even two identical models will not measure 100% identical. Coming from a family of engineers, I could not sleep (well not really 😉 ) before I found a solution for the problem. I finally managed to modify my two pedals to behave almost 100% identical to the old poti style, and this without any drawbacks, like the need to use (and first to find!) some low-quality poti with a similar curve, or to build in active electronic components that require a battery and introduce noise. The ease of use, look and reliabilty of the pedal is not decreased in any way! The modification was very tricky at first (you need inch allen keys that are difficult to get here in Europe, or you constantly wish for thinner but longer fingers to operate things inside the pedal) and required a lot of experimenting (including making myself a little tool), but finally I got it done. I was really surprised about how close my modification is to the original curve (see diagram). If you want me to modify your pedal (should work with all Ernie Ball types, at least for the common 6166 and the 6180 Junior pedals), I will happily do so. I thought it is fair to charge you the same fee as you pay for a repair at Ernie Ball – US $ 55 or 42,- € via PayPal (and what I do is more work than what they do, plus for some pedal models they even charge you US $ 75.) Shipping: You pay shipping to me (Germany), I pay shipping back within Germany, within the EU it is plus 5,- € . If you are from outside the EU, please ask for details before since customs seem to make handling rather difficult. Also ask for alternatives if you don’t want to use PayPal. Use the contact form of this blog for first communication. I will reply via email then! BTW, I will leave in your original poti which means if it is already scratchy, it probably will still be after (although one of mine was cured for some reason after the modification :). I also can open your poti when scratchy to see if I can clean it inside, please inquire for details in such a case. Update: Check the MK-guitar.com shop for our stock of Ernie Ball pedals that are already modified. Hi Ingo! Very interesting article….just two days ago I gave my early 90’s Ernie Ball pedal to the tech because the pot makes noises….it will be soon replaced ! As far as I know, CLAROSTAT was the company that bought ALLEN BRADLEY in 1990 (http://www.ab.com/support/abdrives/files/electronicsdiv.pdf). But as you can read on this link, it looks like from 1988 to 1997 there were several changes in the ALLEN BRADLEY factories while phasing out the production of all the products. This could explain the different behaviour of you 1986 and 1989 Allen Bradley poties. Does your trick work also for this Ernie Ball old model pedal? There is no much electronics in this kind of pedal! Just the poti and 3 cables! 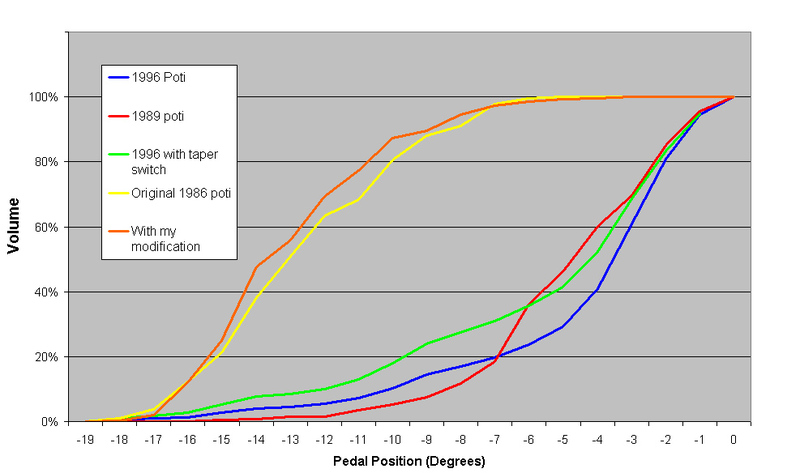 If the trick works, what happens if we need to change the poti in a pair of years in both pedals type? The trick will be still available with the new poties without having to send them back to you again? Really interesting!!! Could you please contact me on my email for next steps? i’m JC from France. I’ve got the same pedal like you (this one wich got the tuner output, and that we could see in the back of the picture when you are making your measures). Do you know wich model is-it, and when is it build (approximately) ? It is still the same model – 6166. They added the tuner output in 1995, and redesigned the pedal in 1998 (jacks on the front), so your pedal must be from this era. I received the modified pedal last week and I tested with the band yesterday. In a word: fantastic! The scratchy problem is completely solved, the pedal is completely transparent and you can control that valve overdrive point of the amp perfectly! Thanks for all! A really good service from you! my tech has replaced the old scratchy pot (Clarostat) in my early 90’s Ernie Ball pedal (in & put – no tuner out) with a ALLEN BRADLEY made in U.S.A. He has found only 3 AB pot! I can clearly hear the volume-position behaviour showed in the curve. The original taper profile looks like what is called an audio taper. 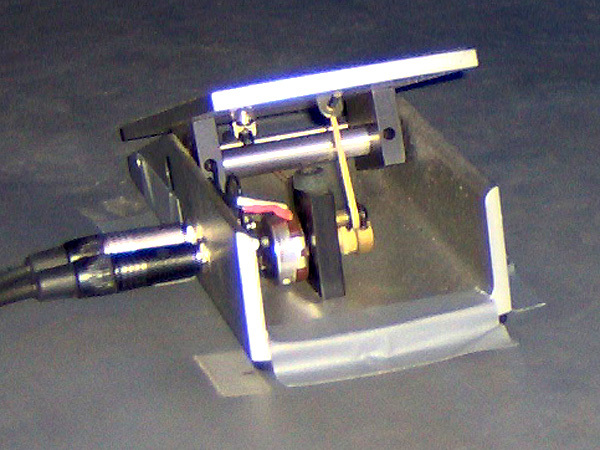 This type of taper is used in most volume controls on radios, TV’s and other audio devices. The newer curves are called a reverse audio taper. There are several other types of tapers that are variations of these two. The other type of taper is called a linear taper. This type of taper will give you the same change in resistance from one degree to the next, from fully CCW to fully CW positions. There is one other type but I don’t think you will be using it. This is called a log or logarithmic taper. You can also have a reverse log taper. Another thing to consider is the type of (Pot, rheostat, potentiometer). There are two main types….wire wound and carbon. Most of today’s pots are carbon and have much less problems with static or scratchy sounds. Most are sealed also but if you get one that just has a foil backing and the glue starts to separate, then you can get the surface of the carbon inside the pot contaminated with foreign particles, which can result in a static or scratchy sound. Most older pots were of the wire round type. In this type of construction, a thin wire was wrapped around a form shaped in a semi-circle. As you turned the knob, a metal wiper would make contact with the wire surface. Over time oxidation would build up on the wire, mainly from none use. This in turn would produce static or a scratchy sound. Many times you could clean away the oxidation by turning the knob back and forth many times. If you ever need to clean a pot because of excessive noise when turning the shaft, you can use a contact cleaner. Just be sure it does NOT contain silicon or you might find out that now your pot is not any good and needs to be replaced. If you can get to the inside of the pot, you can use rubbing alcohol to clean the inside contact area. There are some pots that are made so that you cannot take them apart. In this case you are forced to replace the pot if you cannot clean all that gunk out. One other item of interest is the wattage or power handling capability of the pot. In this application I don’t think you have to worry to much about burning up a pot but I would play it on the safe side and use a 1/2 watt pot. I lived in Orange County, California all my life and know of two electronic stores where you can get most anything you want. 1. Orvac Electronics in Anaheim, Calif. Located on Orangethorp Ave. They should have a web site. 2. Fullerton Electronics in Fullerton, Calif. Located on Commonwealth Ave. They should also have a web site. If you need some old hard to get electronic item, then this is the place I would try first. They might be a little higher in price than Orvac but if it is old then try here first. I never did see the schematic or description of the mod that was talked about. I suspect a resistor was placed across one half of the pot. A resistor from the center terminal to one of the outside terminals. I feel it would be better to just go buy a regular audio taper pot as it will perform much better than adding a resistor. It is not that difficult to dismantle the foot pedal and replace the pot. The old poti had a reversed curve, not the new ones. >>There are two main types….wire wound and carbon. The poti here was a conductive plastic poti. You need to bery careful in fact when using chemicals to clean potis, some are really contraproductive since they will destroy the carbon coat. >>There are some pots that are made so that you cannot take them apart. However, I found a good way to clean them nevertheless. >One other item of interest is the wattage or power handling capability of the pot. In fact this does not matter here. >>I never did see the schematic or description of the mod that was talked about. I suspect a resistor was placed across one half of the pot. No, it is completely different, it is both electronical and mechanical. A resistor will not work (this is what EB try to do with the little switch on the newer pedals), however I can use a resistor to fine-tune the curve after the modification. I meanwhile found that with the later AB or Clearostat poti the modification will result 1:1 to the desired curce, while with the Canadian or Japanese poti it is still a bit different which can be compensated with a resistor in most cases. I’m curious about this mod, but would like more info before I buy. Are you opening the pot and physcially altering the taper by sanding. Or are you altering the circuit by adding components to achieve the different taper? I don’t have to open the poti (I sometimes do so to clean it if it is scratchy), and I am not adding components (it is technically NOT possible to achieve this taper with some taper resistor!!). So what do I do? All I can tell you is that I exactly invert the taper of your poti, it is a mechanical plus an electrical mod, and if you need to replace the poti one day you can still do so. The mod works best with the Allen Bradley or Clearostat potis (used from the 80ies to the mid 90ies or so), the Canadian and Japanese potis (see pictures to identify these) might become a little bit abrupt at the beginning of a fade in. For these I can add a little resistor to make them fade in smoother. The smaller the resistor, the softer the pedal might sound if it is the first device in the signal chain (will sound rather similar to the Morley pedal), if it is not the first device, or is used in an effect loop, the resistor does not have any side effects. One last question – if the pedal is modded, and at some stage I want it un-done, will I need to send the pedal back to you, or can I reverse the mod? Is there soldering involved? I tried swapping input/output on my EB VP and prefer the taper this way. How is your modification any different than just resoldering a few connections to the pot or the jacks? Also, have you ever tried 500k pots? Pedal steel players seem to prefer these as they retain the high end more. I took me little while… but I figured it out! A little research and some staring at parts. I like it , but it is a little abrupt.. I need to figure out what resistor value will help make a smoother taper. Swapping the in and out of the pedal will invert the taper but will also lead to a dull sound while the pedal is not full down. With my mod it does not have this unwanted side effect. A little soldering and a little mechanical manipulation. All the same parts.. reverses the taper as you mention. When I have more time, I will experiment with resistors to smooth out the start of the taper so its not so abrupt. I got it from looking at the pix and some logcial thinking. Its a innovative mod – respect for Ingo for figuring this out. That said I found the taper too direct; my pot is one of the never ones as the VP is one I got from ebay and restored. The original pot was a clarostat but it was very sratchy and it had clearly been subjected to abuse. I eventually reverted my VP back to standard. hi, I am in the US and just purchased a vpjr 25k model. I came across this article because I am unhappy with the taper of my new pedal. Does your fix involve flipping the pot and switching the wires? I am a bass player and am less concerned about losing high end, so I might experiment with adding a resistor, since the 25k model doesn’t include the “taper switch”. What exactly will you be doing to the pedal to get that curve? I have a mini morley pedal is it also possible to mod this one?